On January 7, 2014. Ray Carr of Cleveland’s WCSB 89.3 did a phone interview with me about Muffler Men for his radio show. His program features in-depth, live interviews with movers-and-shakers: politicians, journalists, athletes, and guys like me who are into Americana. He also features unusual oldies and comedy interludes from the 1950s and 1960s. I asked if I could put the interview on the American Giants blog. He agreed to that so I decided to go the extra mile and added video to the audio. So above is the enhanced Ray Carr interview. Ray is going to check back with me from time to time to catch up with my latest adventures. 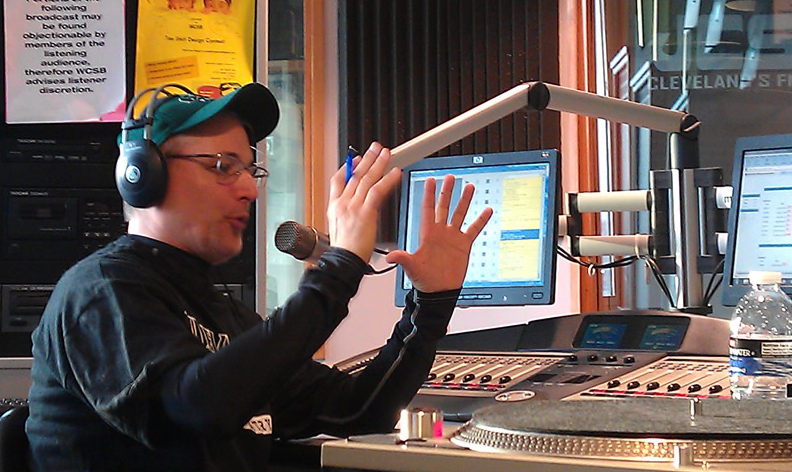 The next interview is scheduled for March 4, 2014 on Cleveland’s WCSB 89.3 at 8:00 AM. We’re happy to release Episode #7 after a long weekend of editing. This episode continues to follow us on our journey through Chicago. The first stop on this leg is at Ced’s Muffler and Brakes on Grand Avenue. This statue at Ced’s is known as a Mr Bendo. There are a couple of other Mr. Bendos elsewhere in the U.S.. We make an interesting discovery on the roof of the building using our GoPro camera. We also make a quick stop at the “Eye Care Indian” that has been on a Chicago rooftop for a very long time. This episode wraps up with a quick preview of Episode #8. You will see more of Bo and Neto in that video as we move on to some of the more famous Muffler Men and try to figure out their histories. Episode #8 will be the last in the Chicago series. 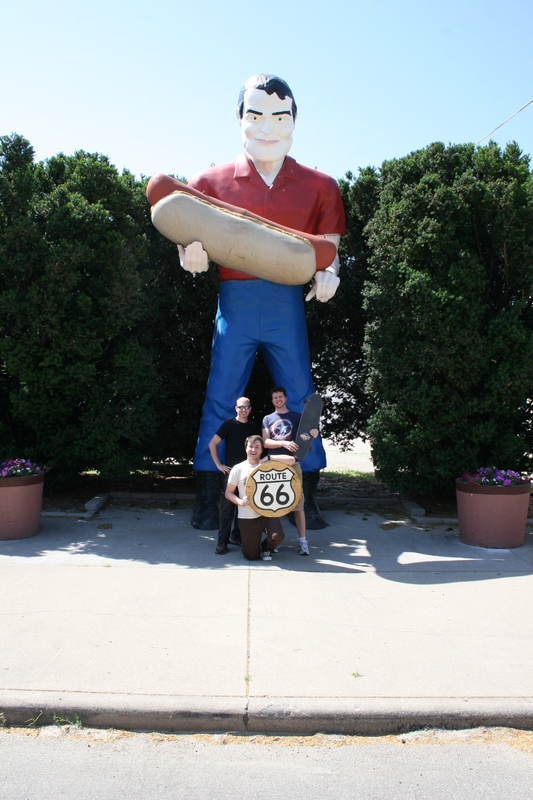 Episode #9 will cover our recent trip to Dodge City, KS to visit the Dennis Hopper Muffler Men. 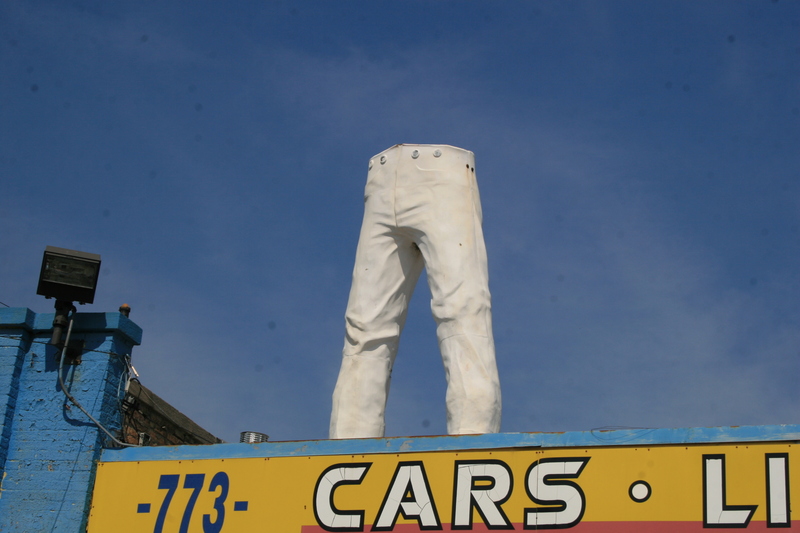 In Episode #6, our American Giants crew continues to make its way around the Chicago area visiting Muffler Men. We start out at the Greenhouse of Crystal Lake and hop over to Lumberjacks, a firewood and mulch business. You will see the Muffler Man that we used for our American Giants Opener and find out some of its history. We end this episode at Lambs Farm in Libertyville and realize just how long this 15 foot tall lumberjack has been around! After traveling up old route 66 through Illinois the crew finally arrives in Chicago area to check out the seven muffler men located there. In Part 1 of this Chicago section they discover some interesting facts and history on the muffler man located at the Greenhouse of Crystal Lake as well as the ruins of the old Adventureland park in Addison, IL. I think this is one of the more exciting adventures I have been on with finding the exact location of the park and going there. I was able to locate “the ruins” of the park now buried in the woods. Although the exact spot where the muffler men stood is now relanscaped much of the parks foundations can still be found in the back of the property. After a few delays I’m finally releasing a partial version of episode #4. On this segment of the trip we deviate off route 66 to visit one of the rare female versions of muffler men found in Peoria, IL. She is known as Vanna Whitewall and has stood at Plaza Tire since the 1960’s . We were able to talk with Terry Swisher and find out about her history and hear some of her stories over the years. She is unique in the fact that her outfit is changed out twice a year to coincide with the seasons and she also still has her original International Fiberglass platform. From there we traveled on to visit the Gemini Giant in Wilmington, IL but this section of the episode has been cut out until I can get in contact with the owners and do some fact checking and permissions.